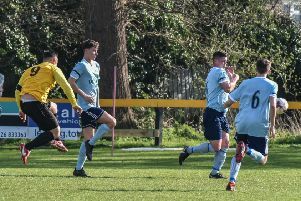 Jake Brown scored the only goal of the game as Racing Club Warwick beat Midland League Division One leaders Leicester Road. Racing Club bounced back from their 3-1 defeat to Atherstone by stunning leaders Leicester Road on Tuesday evening. On a murky and very wet night, Racing started brightly and a Wade Malley shot scraped the post after a slight deflection before Road showed their title credentials. The Hinckley side dominated possession but a stern Racing defence looked unbreachable. When Leicester did have a sniff, the impressive Eddie Caviezel-Cox was in commanding form. Malley looked increasingly isolated up front as the majority of play was centred in the Racing half. Alex Price was introduced into the middle for the hosts in the second half and he started to pull the strings to give Leicester Road more to contend with. Racers’ improvement was validated in the 56th minute when they took the lead. Jake Brown picked up the ball on the left and jinked inside before sending a low drive across the keeper and into the bottom right-hand corner. This sparked an onslaught from the visitors, with Caviezel-Cox producing a fine stop with his legs to maintain Racers’ advantage. A string of crosses rained in from the right but despite the pressure the hosts looked dangerous on the break and Brown struck a post late on. A late challenge on Caviezel-Cox in the last minute led to a ten-man shoving session which resulted in Toby Checketts seeing red for the second time in four days, but Racing Club held on to their slender advantage.